Spirit of South Carolina is a two-masted, gaff-rigged pilot schooner, reminiscent of one that served the pilots of Charleston harbor for 25 years in the late 1800's. Launched in 2007, she is fully certified by the U.S. Coast Guard as a Sailing School Vessel under Federal Regulations. 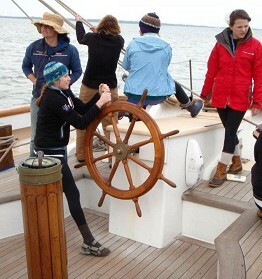 To date about 9,500 sail trainees have sailed aboard. Built over nearly six years by skilled, experienced shipwrights, she uses traditional shipbuilding woods: Live Oak, Angelique, Longleaf Pine, Purpleheart, Sapele, Teak, Cypress, and Douglas Fir. Captain Richard Bailey calls her the Mercedes-Benz of the schooner fleet, with sparkling brightwork, rich interior joinerwork, and yacht-like finish. The vessel is fully equipped with modern electronic communications, navigation, and safety gear. She has two diesel main engines and a diesel generator set. 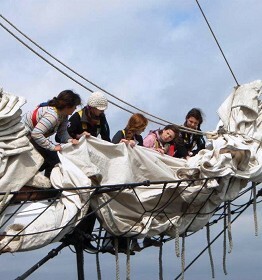 With all five sails set she spreads almost 6500 square feet of canvas. In the fall of 2015 Spirit of South Carolina went through a major refit in the Newport Shipyard in Newport, RI. Captain Bailey previously served as Commanding Officer of ‘HMS’ Rose, a three-masted square-rigged frigate, the largest ship ever certified by the US Coast Guard as a Sailing School Vessel. While under his command, Rose was featured in the movie Master and Commander. 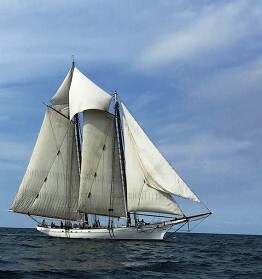 Captain Bailey has also served as captain aboard the sailing-school schooners Spirit of Massachusetts, Westward, and Harvey Gamage, and the three-masted barkentine Gazela Primeiro. He describes his own sail training as consisting of "climbing up the hawse pipe". Beginning at age 18, he worked as a deckhand until he had the hours to move up the ranks. He holds a “Master of Sail Vessels” to 1600 ton/Oceans license from the U.S. Coast Guard and has sailed square-rigged ships for decades.